VoLTE, as a rising technology, forces operators to tackle problems they never had before. Commonly, LTE radio network settings are optimized to ensure good performance for data services, and when commercial VoLTE deployment arrives, unexpected issues and customer complaints can appear. 3dB CONSULT has helped operators to test their networks and ensure the correct configuration to maximize VoLTE user experience. Following is one of the many troubleshooting activities we have performed to ensure expected user experience. 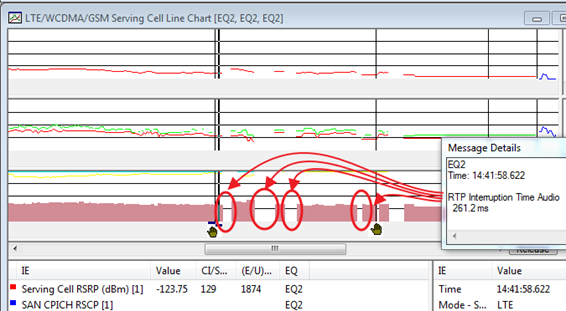 In this case, the customer was experiencing VoLTE call drops every time when entering their underground garage. At the same time the data experience was still very good. After assuring that the problem was not caused by HW faults we performed drive tests in the problematic area to analyze the UE behavior in the network. These measurements provided necessary information about serving cell and RSRP in each geographical point. Once in the basement, the UE performed several Intra-LTE and Inter-LTE handovers, but only when the car was far enough from the entrance it initiated the B2 event and handed over to 3G. At the same time, we could appreciate that the quality of the VoLTE call was very poor and the voice even suffered from several muted audio periods. Clearly UMTS was providing better coverage in the garage, so it was decided to speed up the HO from LTE to 3G. However, these most obvious changes did not solve the problem and the customers continued facing the same issue. HO to other 3G frequencies so the problem was not perceived by end users. After enabling SRVCC to U900 band, the problem was solved and VoLTE UE’s began to successfully hand over to 3G when entering the underground garage. In conclusion, it is important to understand how networks work and how different features and parameterization are inter-related with each other. 3dB CONSULT has the knowledge and experience to solve any problem in your radio network whether it is GSM, WCDMA or LTE! This doc has been redacted by Verónica Martínez, MD Engineer in 3dB consult.